Note: This post contains Amazon affiliate links. Your support of Sewing Mamas when you click through our links is appreciated! Today’s project came from a lovely tutorial from ikatbag. It stands up all by itself, even when it is empty! Suggested fabrics for this pouch are a heavier weight home dec or similar fabric for the outer and then a lining fabric. 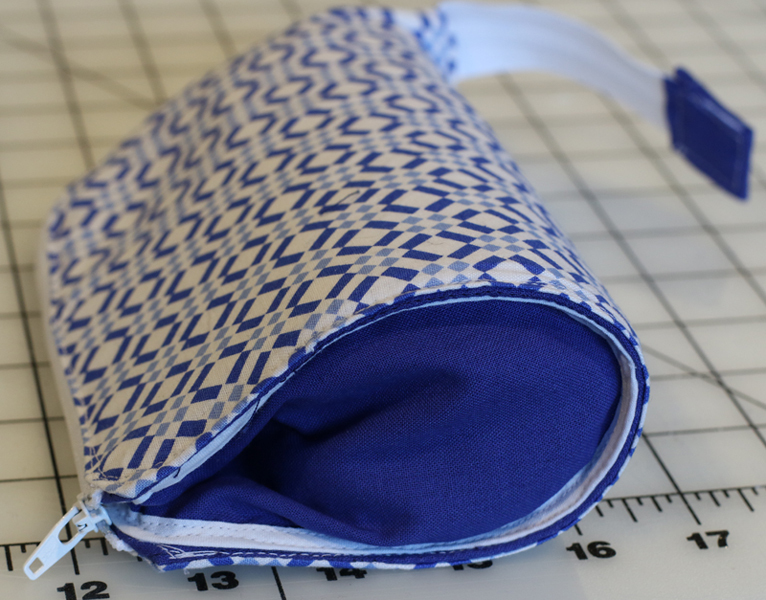 The lining fabric shown in the tutorial is a ripstop nylon. 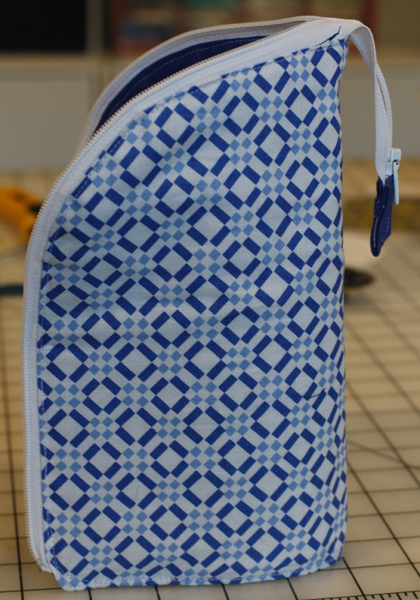 I did not have any ripstop nylon and opted to use quilter’s cotton for both the outer and lining fabrics. I also considered and then ignored the suggestion of reinforcing the outer fabric with a thicker piece of fabric. I did, however, use two pieces of fabric for the base/front wall piece. Since this is attached with bias binding, layering the two pieces together was an easy-peasy way to add a bit of strength. I did consider using a piece of denim there, but the idea of sewing through denim + double folded bias binding + three layers of quilters cottons (inner, outer and template plastic holder) + the zipper tape seemed like more fun than I was ready to handle this afternoon. 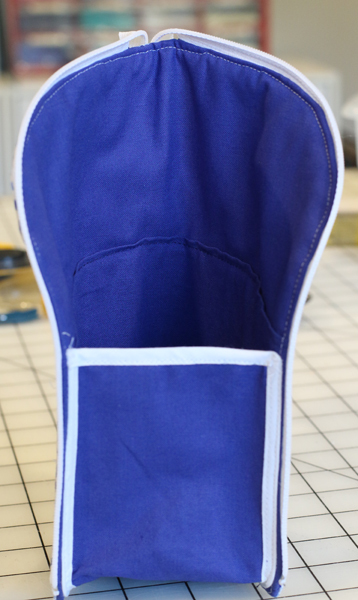 The original has a little pocket on the piece that is referred to in the tutorial as the base/front wall, which is the blue solid that is surrounded with white bias binding in the photo above. 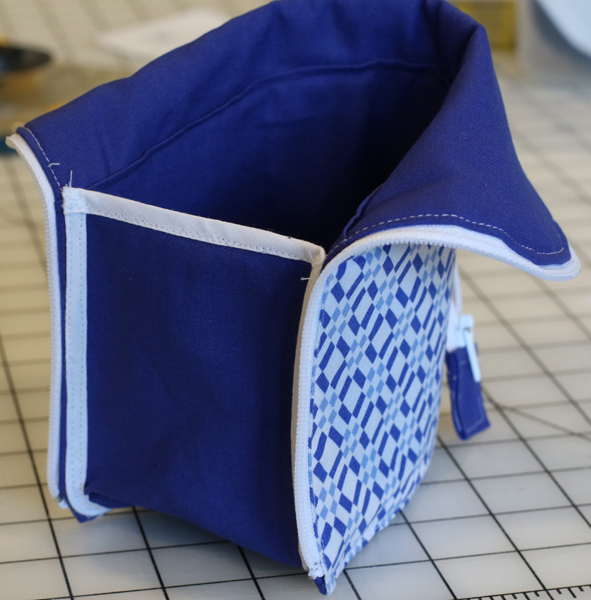 When the pouch is zipped, the pocket would be folded and could not contain anything substantial. I left it off. The tutorial does not have any photos that show anything in the pocket, so I am not sure about its intended use. 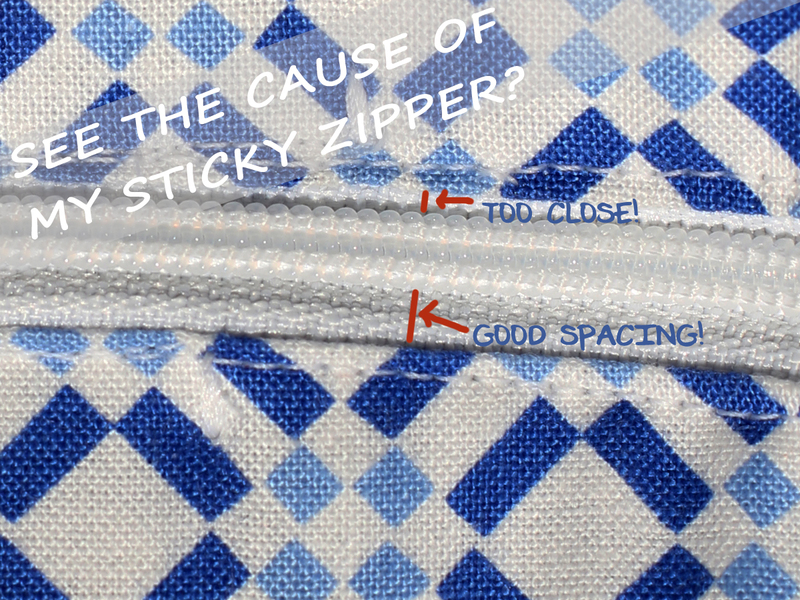 At one point, use of a separating zipper is suggested. What is not mentioned (or I missed it) is what size and length of zipper should be used. I did not have a separating zipper in a suitable length, so I ended up just using a non-separating zipper, which worked out fine. I believe the one I used was 14″, as the instructions called for a zipper at least 3″ longer than the opening. I left it at that length when I put the tab on the end, but I feel like it would work just as well if I had shortened it to have less extra. My stitching on the zipper is a bit too close to the teeth near where the front wall attached and the pull gets stuck sometimes. I will be more careful next time to leave more of the zipper tape visible so the pull has more room to zoom about. If I were going to give this to one of my kids, I would probably also use a zipper with bigger teeth, though this one works. Attaching the zipper is not difficult, getting the base/front wall piece on is much more fiddly – and annoying. I did pin the center and lined up what ends up being the top of the front wall to keep the sides even. This ended up being the most challenging part. Normally I would use wondertape on it, but I didn’t want to do that here since I wasn’t planning to wash the bag. (Wondertape washes out, and it is great to keep wiggly things in place while sewing.) There are also some small Wonder Clips out now that I think would be worth trying for this. I have this size Wonder Clips, but the new smaller mini Wonder Clips might be better for this situation. 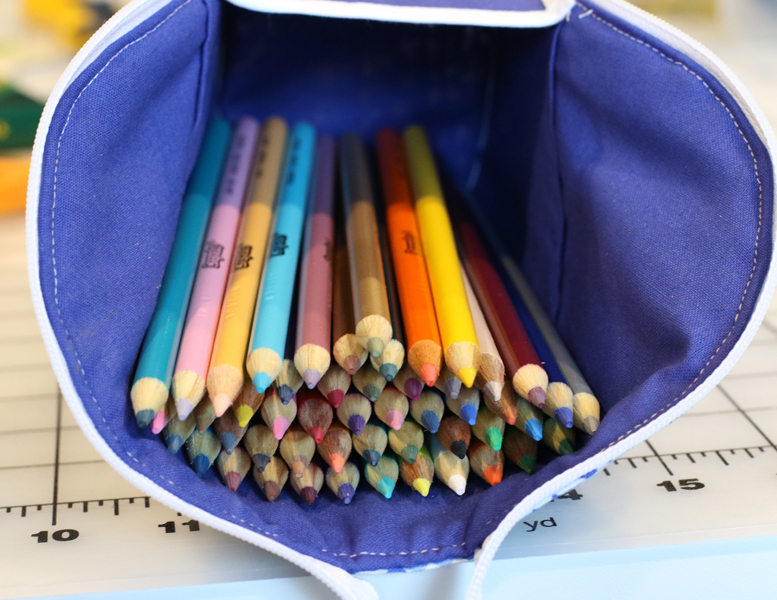 Having the contents of the bag upright is a really nice feature, particularly if you are using this for colored pencils or markers. 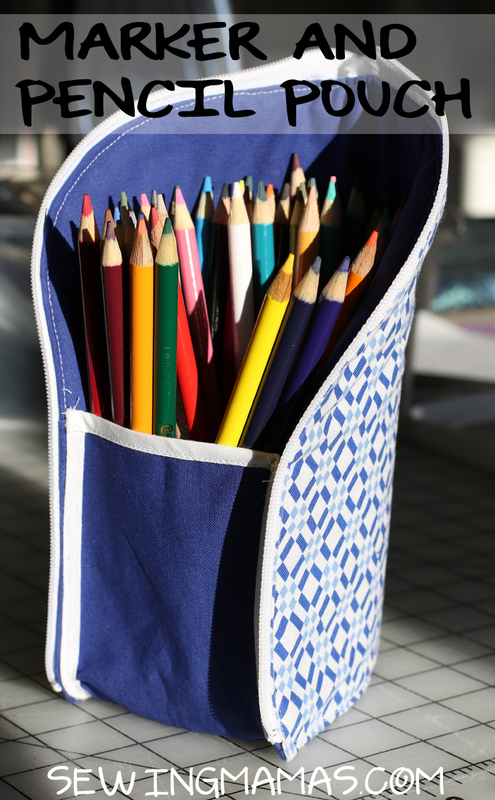 With a regular zip pencil bag, the color you want always seems to be at the bottom. You either have to dig through everything over and over or pull everything out and just leave things out while you are using them. 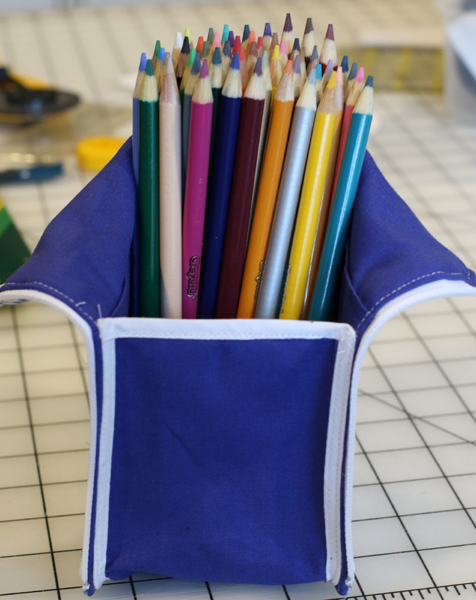 This upright bag is a portable pencil cup, perfect for occupying a preschooler in a restaurant as well as a tween who wants every color available for her latest project. This bag has 50 colored pencils in it. As you can see, there is plenty of room for more! 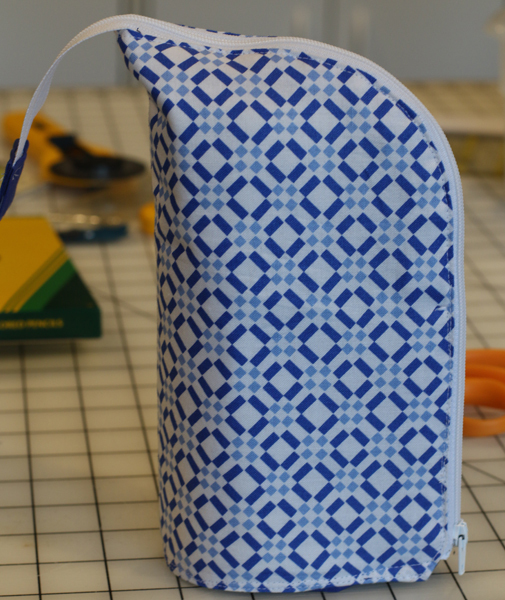 Head over to ikatbag for the tutorial and make your own zipped pouch! I’d love to see it when you’ve finished. Share your creations on the Runway in our forums! This pair is for Zoe’s birthday. Once again, I pulled out my trusty manual and carefully followed the instructions for flatlocking. I just couldn’t get the fabric to lay flat. I decided to look at the other stitches. The blanket stitch and ladder stitch looked like possibilities. Would they be strong enough? They are described as decorative stitches and I’m trying to keep a sock together. The blanket stitch instructions involved water soluble stabilizer and more fuss than I wanted, so I went with the ladder stitch first. I’m so glad! A hot topic of discussion lately on one of the forums I frequent has been JoAnn’s processing of buy one get one free items. It seems they have recently implemented a new computer system where all the lowest priced items are free in a buy one get one scenario. At first glance, this seems like a reasonable process. But, a closer look and one quickly realizes the flaw. If there are only have two items in the transaction, the lower priced item should be the free one. If there are multiple items, the distribution of discounts needs to change. Huh? Here’s an example. Ann questions the total and the cashier explains that is how the computer does it, but if she rings each set of buttons separately, Ann’s total will be $19. Of course Ann would prefer to use her $9 to get lunch on the way home from shopping, so the transaction is canceled and rung as four separate transactions. Ann leaves the store, having paid what she expected but is frustrated by her shopping experience. 1) It’s a terrible customer experience. You either pay more than you expected or suffer through multiple transactions. 2) It’s an inefficient use of store labor. Cashiers are either ringing multiple transactions for one customer or ringing returns and new transactions after the original. 3) It’s more expensive to process all those transactions on several levels. a) Ringing multiple credit card transactions is more expensive for the merchant than single transactions. b) There is a higher amount of data needing to be transferred/kept on the servers. Even though they are smaller transactions, there are still many more of them and each one has transactional data attached to it. c) Customers given 5 receipts for 10 items are more likely to lose the receipt they need (one of the five, undoubtedly) and need assistance. 4) It distorts the store’s sales numbers. By having so many more transactions, it skews numbers computed about the average per transaction. The average transaction’s sales dollar total goes down, for example. The attachment rate of other products goes down – if Sue buys 10 b-g items and 3 associated items, the cashier rings 5 transactions. The first 4 transactions are only b-g items. The fifth is b-g and 3 other things. So, in quick data analysis, it looks like 4 people came into the store and only bought b-g items. This one is for my nephew, whose birthday was Friday. Kwik Sew 2918 in size 2T. Hope it fits!